This post is sponsored in conjunction with PumpkinWeek . 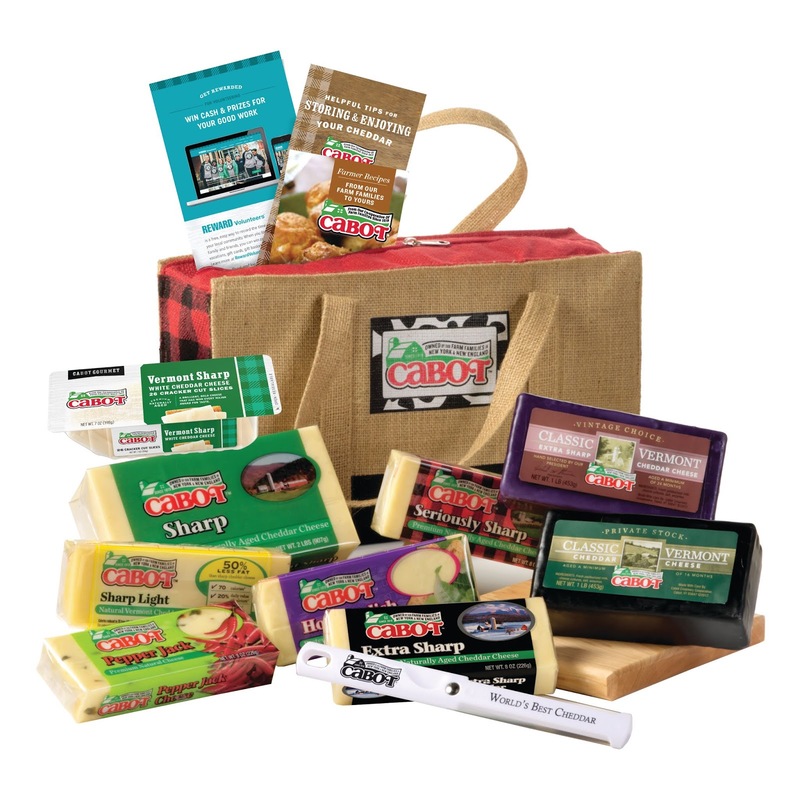 I received product samples from sponsor companies to aid in the creation of the PumpkinWeek recipes. All opinions, as always, are mine alone. 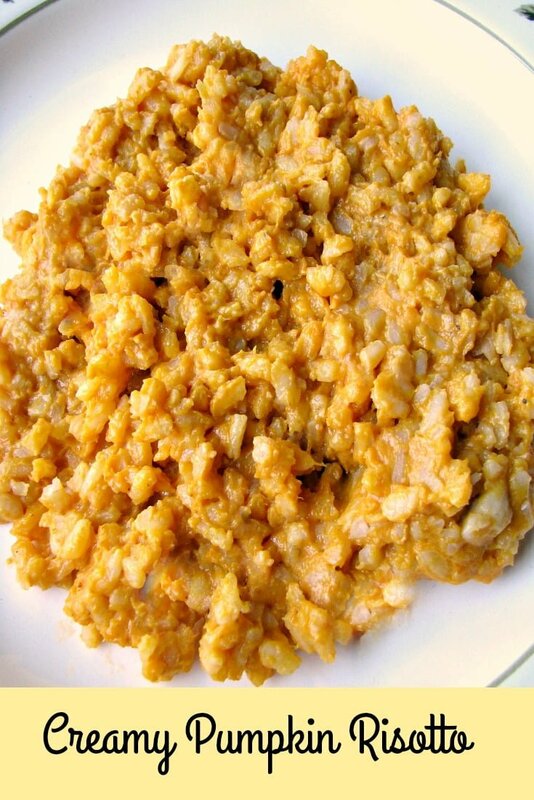 This Creamy Pumpkin Risotto recipe is made with arborio rice and finely diced onions simmered in white wine and chicken broth. Pumpkin puree and a touch of light cream added at the end of cooking make this a perfect Fall main course or appetizer. Long time, no see! I know, I know. Summer got away with me, I barely shared anything new this summer, and now it’s almost Fall. If you have stuck with me for a long time, you already know that pretty much the only thing I like about Fall is pumpkin, so #PumpkinWeek is the perfect time for me to come back. I thought about making this Creamy Pumpkin Risotto in the Instant Pot or as an oven baked risotto, but I’ve only ever made traditional risotto recipes, so I decided to stick with what I know, and now I’ll show you how to make risotto. Start by putting butter and olive oil in a high rimmed pan or pot over medium heat. Meanwhile, heat chicken broth in another medium pot. 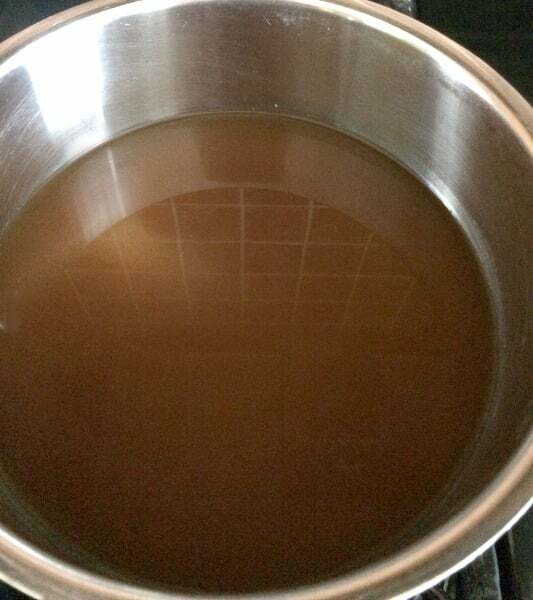 I used a roasted chicken broth that is a lot deeper in color than some other store-bought chicken broths. You want to have the broth hot, but not boiling or even simmering. Add chopped onions to the melted butter and saute for about 3-4 minutes over medium heat. I forgot to get a picture of this part. Then add in arborio rice and stir continuously for 3 minutes. 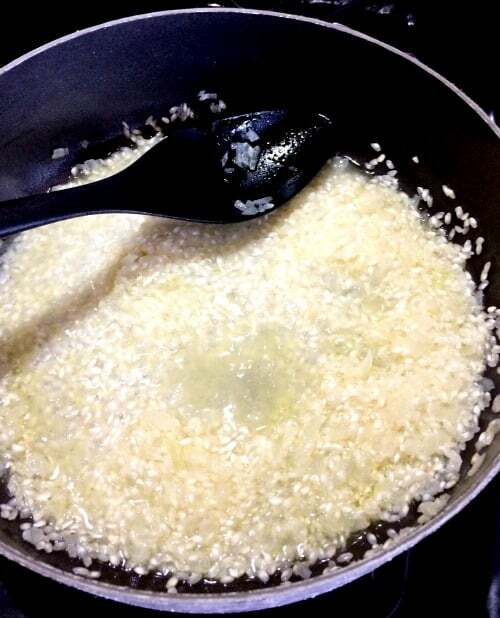 Add white wine, and cook, stirring continuously, until the wine is fully absorbed into the rice. You can skip this part if you want to and use chicken broth only. Add the chicken broth, one soup ladle at a time. Let each ladle full of broth fully absorb into the rice before adding more. You will need to stir the rice often, almost continuously, at this point. You want the broth lightly simmering, not at a full boil, in order to give the rice time to fully cook, so adjust the heat as needed. When you are down to the last ladle or two of broth, taste the rice before you add more. 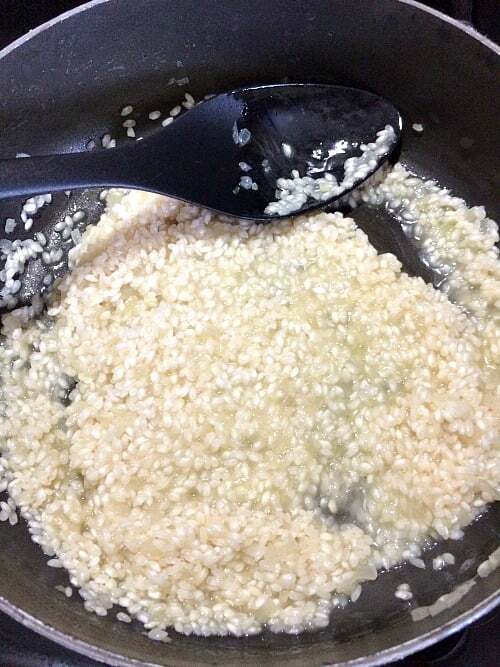 The rice is done when it is al dente (fully cooked, but firm to the bite). It will look like this. Next, stir in pumpkin puree, grated Romano cheese (or Parmigiano-Reggiano) and light cream. Cook for just a minute or two more, stirring continuously, until the cream is fully absorbed and the pumpkin clings to the rice. Serve this Creamy Pumpkin Risotto immediately. Leftovers can be covered and refrigerated, but the risotto may not be as creamy reheated. 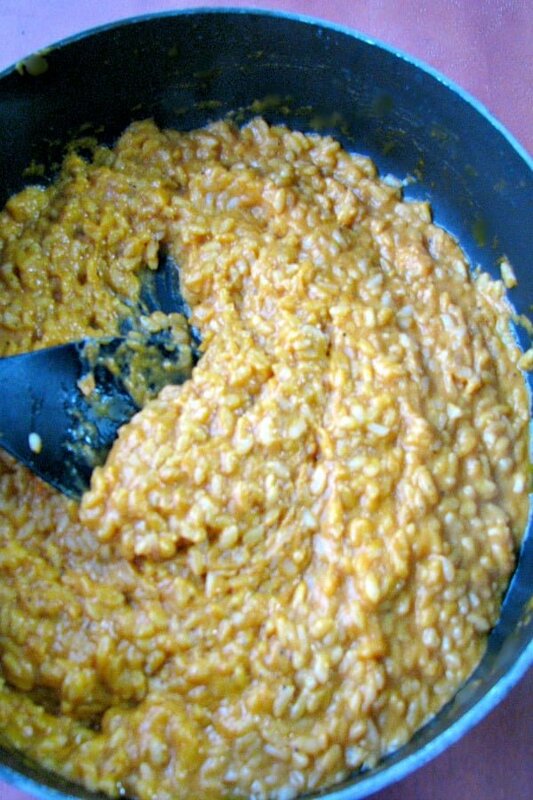 Read on after the Creamy Pumpkin Risotto recipe to see all the other recipes shared today. This Creamy Pumpkin Risotto recipe is made with arborio rice and finely diced onions simmered in white wine and chicken broth. Pumpkin puree and a touch of light cream added at the end of cooking make this a perfect Fall main course or appetizer. 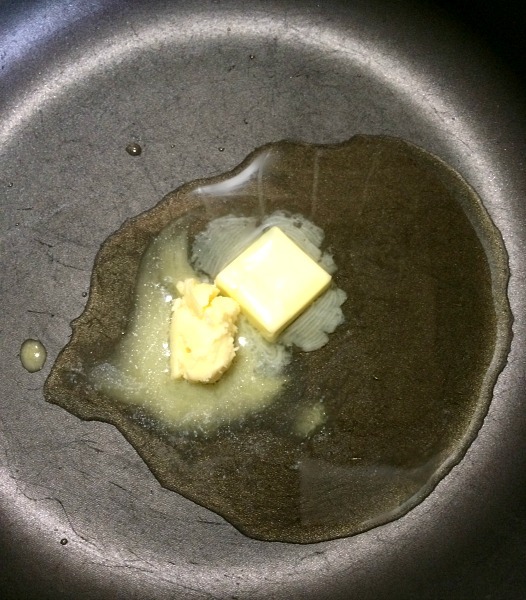 Put butter and olive oil in a high rimmed pan or pot over medium heat. When the butter melts,add chopped onions to the melted butter and saute for about 3-4 minutes over medium heat. Meanwhile, heat chicken broth in another medium pot. You want to have the broth hot, but not boiling or even simmering. 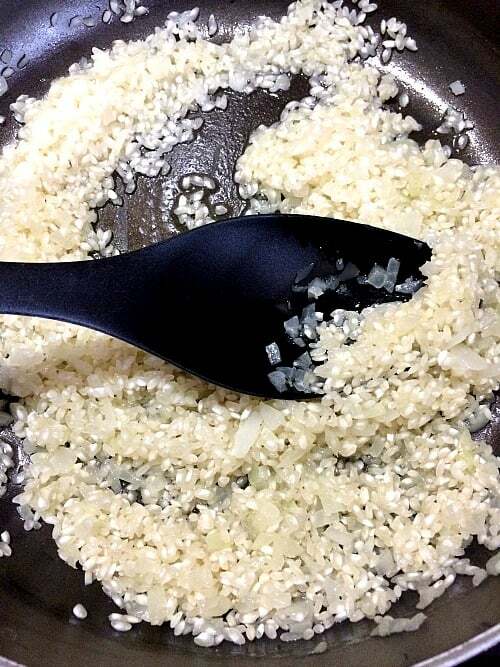 Add the arborio rice to the sauteed onions and stir continuously for 3 minutes. Add white wine, and cook, stirring continuously, until the wine is fully absorbed into the rice. Substitute additional chicken broth if desired. Add the chicken broth, one soup ladle at a time. Let each ladle full of broth fully absorb into the rice before adding more. You will need to stir the rice often, almost continuously, at this point. 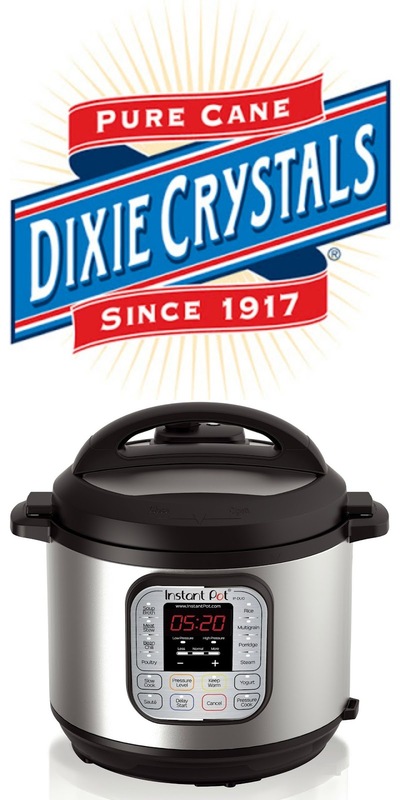 You want the broth absorbing into the rice lightly simmering, not at a full boil, in order to give the rice time to fully cook, so adjust the heat as needed. When you are down to the last ladle or two of broth, taste the rice before you add more. 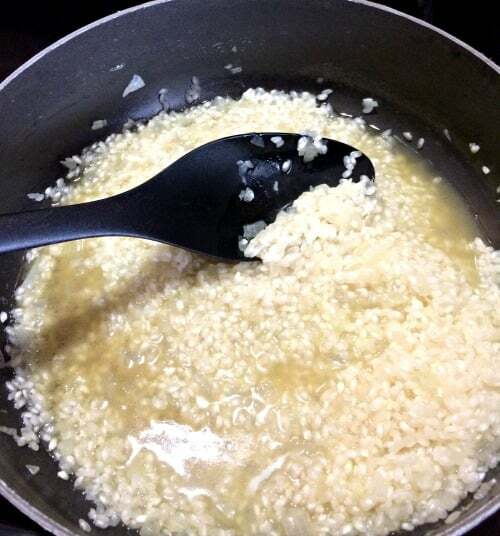 The rice is done when it is al dente (fully cooked, but firm to the bite). 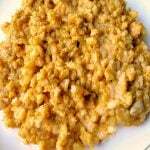 Stir in pumpkin puree, grated Romano cheese (or Parmigiano-Reggiano), and light cream. Cook for just a minute or two more, stirring continuously, until the cream is fully absorbed and the pumpkin clings to the rice. 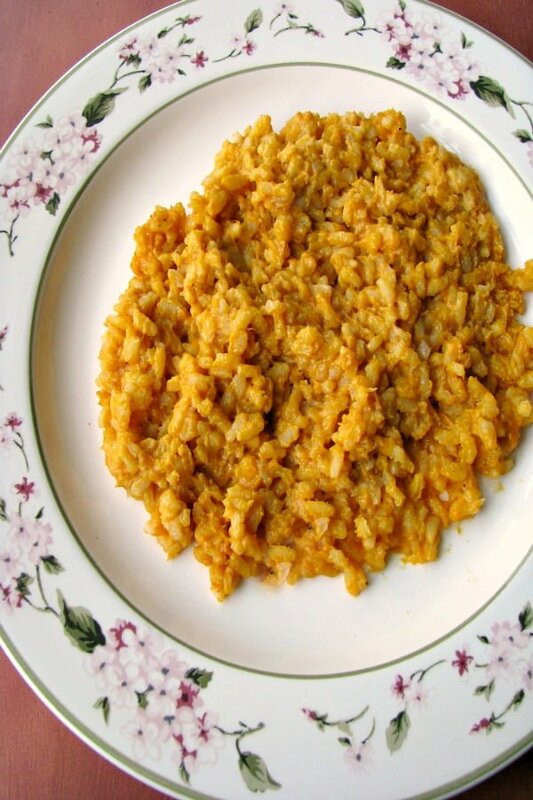 Serve this Creamy Pumpkin Risotto immediately. Leftovers can be covered and refrigerated, but the risotto may not be as creamy reheated. 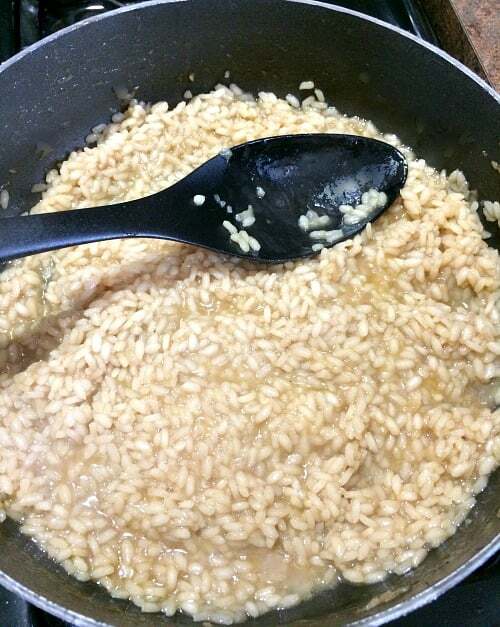 Nothing more comforting than risotto. Love this pumpkin version.